I recently went to the 2010 KidLit Conference, a conference celebrating young adult and children's books, the authors who write them, and the bloggers who blog about them. The Betsy-Tacy books were all the rage at the conference and I felt like a bad Minnesotan because I had never heard of them. Yes, I've heard of the author Maud Hart Lovelace, but in the same way I've heard about Jon Hassler – I know they are popular Minnesota authors, but their books have never been on my nightstand. The first thing you should know about the Betsy-Tacy books is that Betsy and Tacy are two separate people. When everyone was praising them I thought the girl's name was Betsy Tacy. Silly me. You should also know that the books follow Betsy and Tacy from when they are five years old and into their young adulthood. As the girls age, so do the books. Each book is written for children or young adults who are the same ages as Betsy and Tacy. 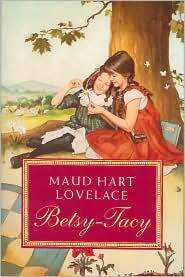 The first book, Betsy-Tacy, introduces us to the headstrong, imaginative Betsy Ray who is just about to turn five at the end of the 19th century. When new neighbors move into her Hill Street neighborhood in the fictional town of Deep Valley, Minnesota (based upon Mankato), she quickly becomes inseparable with their five-year-old daughter, Tacy Kelly. Tacy seems to be more of a side character throughout the book. She is shy and scared and Betsy continually overcompensates for her. The book should probably just be called Betsy. The rest of Betsy-Tacy isn't written in a way that I find interesting. Each chapter is like a short story about the girls, almost as if a little kid is telling you a story. And then we ate supper on the hill and pretended we were floating on a feather. And then we went to school and Tacy cried. And then we sold jars of sand. And then Betsy's mom had a baby. And then we met Tib. The story isn't very fluid and I found myself wondering why these books were so well received. The second book in the series, Betsy-Tacy and Tib, is better than the first in that it does not feel like each chapter is an independent thought. The chapters flow much better and we revisit certain situations, like how much the girls want to fly. My favorite part is how bossy Betsy talks the other two girls into flying out of a tree, but when it's her turn she tells an elaborate tale about why they shouldn’t and she climbs down. Oh, Betsy. The book does flow better, but the situations the girls get into are very, very simple. They cut big chunks out of their red, brown, and blonde hair in order to share pieces of it with each other. They get in trouble for being naughty so they decide to start a kindness club. Everything is so simple. I know they live in the late 19th century, but I was hoping for more. Not that they have to get into scary, dangerous situations, but I wanted something else. More of an insight into their world or more comedic situations. I just wanted more depth. I was about to give up on the series, but thank goodness for the third book, Betsy and Tacy Go Over the Big Hill. The title still makes me laugh, but I'm so glad they went over the big hill. In this book, we get more of the depth I was looking for. Now ten years old, the girls venture out further from their homes than ever before. When they do, they run into another girl who doesn't speak English. This is when we learn about the Syrian immigrants that live on the other side of town. The addition of immigrants and the girls' questioning and understanding of them is really touching and gives more depth than previously seen in earlier books. A great interaction between the girls and the Syrian community is when the girls engage them in a community-wide vote for queen. Who is going to be queen of the neighborhood, Tib or Betsy's sister Julia? Betsy's dad decides the only fair way to choose is to ask the neighborhood to vote. Betsy and her crew ask for votes from the Syrian community her older sister knows nothing about. The third book has restored my hope for the books. It was much more fluid and interesting and instead of being just about Betsy, I have a better idea of the characters of Tacy and Tib. Betsy is excited and jumps in without thinking. Tacy is more of a follower, but her voice is getting stronger the older she gets. Tib is the voice of reason who always says the right thing even though the other two don’t want to hear it. They balance each other well and I look forward to the other books in the series. I’m so glad you stuck with them! It’s true that the first books are written for a very young audience and they do develop as the girls age. The next book after Big Hill is Betsy and Tacy Go Downtown and that one is delightful. And then you’re in for the real treat – the high school and beyond books. Keep on reading, I promise you won’t be disappointed!